Our garage floor was a terrible sight. We previously applied floor "paint" for the garage but over 7 years the floor became ugly brown and the heat from our car tires cause the covering to peal. We never thought about hiring a professional contractor before and didn't really know how to clear up our garage floor. We received a KoolCote card through the mail and decided to get an estimate. This was one of the best decisions we ever made because the price was right and the outcome amazing!!! Hi Tyler - just a quick thank you to YOU, the crew on our project, and the KoolCote company for everyone’s efforts in completing our patio project! We are very happy with the resurfacing of our patio! To get to this point, I wanted to highlight items that made this all possible. First, since moving to Austin three (3) years ago, we have dealt with many service companies from lawn care to painting to pool and appliance service. Without a doubt, KoolCote (and Tyler Reisig) is/are the most reliable and customer oriented company we have worked with regarding our needs! It all starts with you, the face of Koolcote for us (the customer). You are knowledgeable, professional, and trustworthy. You gave us the confidence we needed after bad results with other service companies (including a patio resurfacing company)! When our project hit a snag last fall (to no fault of KoolCote) you refunded our deposit; another sign of a reliable, customer service oriented organization. When we restarted the project in the spring, you helped us with our concrete company to get the surface conducive to KoolCote’s needs. We cannot thank you enough! The project itself was also terrific! The KoolCote crew was great. They were methodical, professional, and answered any questions I had. Their ‘prep’ work was impressive from covering the pool to masking areas as needed. They did everything you had outlined in the proposal and more. They were very productive and all business. My biggest mistake was not finding KoolCote years ago (as we would have avoided issues with the prior resurfacing company). Actually, it was you that found us via your mailer advertisement. We had the need the rest is history. So thanks to all at KoolCote and your first rate approach to customer service and delivering on your promises! We would be remiss if we did not mention the daily phone calls from Brandy and others outlining the daily work to be performed and approximate time of arrival. Thanks again to everyone at KoolCote involved in our project. You made us feel like we were very important! Awesome job KoolCote! Your team did an amazing job from start to finish - we love our new deck! Thank you! Thanks a bunch. Looks fantastic. My wife is very happy. We are extremely pleased with it. Additionally wanted you to know that we are very impressed with Efrain’s work, our installer. He was very professional, polite and efficient. He was patient in explaining processes and very attentive to detail. Good worker and good guy. Please pass these recommendations on to management and to Efrain. Thanks to the KoolCote team for a job well done. I found KoolCote through a flyer and took a chance. Got great follow-through from Tyler who made me comfortable with the process and gave me an excellent offer. The crew of Jose and Cameron showed up on time, worked diligently and did an excellent job. They were courteous, professional and personable. The office called each morning to inform me when the crew would show up and made themselves available for questions. Great customer service, excellent product, fair price. Couldn't be happier. Thanks! Casey and Isabel are awesome! These guys are top notch professionals and koolcote did a great job on my porch. They did everything they said they would. I would definitely recommend them to my friends. I love my new patio and deck! When we built the pool (35 yrs ago) it had an aggregate deck and our patio was smooth concrete. With the resurfacing now all matches and it is kinder to bare feet! Thanks to Hank who explained things so I could understand and answered all my questions. Thanks to Maria and Brandy for keeping me up to date on arrival of the crews daily. And a BIG thanks to Chris and Cesar for the wonderful job they did with the resurfacing. Wish I had done it years ago! I just wanted say what a great job the crew did. They worked hard and both the patio and front porch turned out great! They also do a a really good job cleaning up all the remnants for the tile removal. Thank you for a great job. Wish we'd done it sooner! You guys do business the way it should be done, from the first time we met, to the daily calls, and the professionalism of your workers. You guys are a first class company. I am very pleased with the pool deck and patio resurfacing KoolCote performed for me. Steve, the estimator met with me and saw the problems I was having with the existing texture dis-bonding, flaking, and fading. He explained the steps in the process that needed to be performed to resolve the issues and gave me a price which was much better than the company I had used before. The last company had only a 1 year warranty and KoolCote offers a 3 year, which is a big plus for me. KoolCote was also able to start the project within a week; the other company could not start for 90 days. I cannot say enough good things about the crew (Ramiro and Lucio) who performed the work. They were totally in-sync with Steve on the process to be used for resurfacing. They worked very hard as a team, even in the blistering heat. I would occasionally go out and ask them questions and they were always patient and explained what they were doing and what the next step would be. Romiro and Lucio were always prompt at showing up for work and worked until each day’s process was completed. They completed the project on time (3 days). Ramiro and Lucio cleaned up the site every day before leaving and even washed the dust off furniture, bushes and plants after doing the grinding. The process went very smooth and the end product looks fantastic. Thanks Steve, Ramiro and Lucio for your professionalism and expert workmanship. Installed mastic strips for driveway expansion joints. Great job, should have used them when the driveway was first installed. We are ecstatic with the job. Truly impressive. We were very happy with the three porches KoolCote painted for us. They did an excellent job tapin goff the railings on the porches and the stone walls of our home to ensure that paint only went on the porches. Everything was cleaned up afterwards and left in better shape than when they arrived. Ashley and Glenn were wonderful to work with and the work crew in Houston did a fantastic job! I will definitely recommend this company to others. It is beautiful! My son-in-law just flew in and he thinks it is perfect. They did a wonderful job, wonderful job. It is beautiful. Thank you so much! When I first called the company I was very skeptical on how their products work but shortly after talking to the owner "Corky" I was put at ease.You will not find another owner as professional and genuine as him.He certainly takes pride in his company and his work.His sales agent "Hank" and the manager "Julio" are both very nice and professional.They worked on our front and back porch and we have been very pleased with their work. I highly recommend them.You won't find another company like them in town. It looks great! We get a lot of compliments. Complete satisfaction. Work was done exactly as scheduled. Could not have been more pleased with end result. I am very pleased with the pool deck and patio resurfacing KoolCote performed for me. Steve, the estimator met with me and saw the problems I was having with the existing texture dis-bonding, flaking and fading. He explained the steps in the process that needed to be performed to resolve the issues and gave me a price, which was much better that the company I had used before. The last company had only a 1 year warranty and KoolCote offers a 3 year, which was a big plus for me. KollCote was also able to start the project within a week; the other company could not start for 90 days. I cannot say enough good things about the crew (Romero and Lucio) who performed the work. They were totally in-sync with Steve on the process to be used for the resurfacing. They worked very hard as a team, even in this blistering heat. I would occasionally go out and ask them questions and they were always patient and explained what they were doing and what the next step would be. Romero and Lucio were always prompt at showing up for work and, worked until each day's process was completed. They completed the project on time (3 days). Romero and Lucio cleaned up the site every day before leaving and even washed the dust off the furniture, bushes and plants after doing the grinding. The process went very smooth and the end product looks fantastic. Thanks Steve, Romero and Lucio for your professionalism and expert workmanship. KoolCote is great. Their estimate was professional and lower than the other guys (named after sun decking), their work looked great, and five years later it still looks good. I even had a little spot that was marred by some chemical work, and they worked me in to come by and patch it just to provide excellent customer service! Do not be fooled into thinking there is only one option when doing your sun deck around your pool--you owe it to yourself to call Bianca and let KoolCote give you an alternate bid! Thank you for setting a high standard, which is not always the case with pool-related contractors! Thank you, your guys did a very good job. They helped me to fix a water drainage problem and the deck looks GREAT. From the time Bianca answered our first phone call we felt like we had found a company we wanted to do business with. The sales representative was on time and very helpful. I am sorry I can't think of his name as I write this.The work crew, Lionel and Isaiah were clean and worked very carefully so as not to make a mess. They covered everything not to be KoolCoted. They cleaned up after themselves and left everything tidy. The floor is beautiful and we are very happy. Thanks for a job well done. 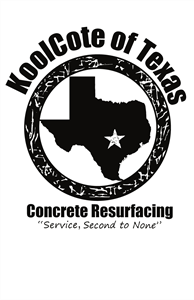 Like so many of the other testimonials said, KoolCote's employees go above and beyond. In a time when the word 'service' seems to be obsolete, the folks at KookCote keep it alive. After the heavy rains which caused some ground shifting resulting in some hairline cracks in the surface, KookCote came out and did a marvelous job fixing them. I don't know what his title is, but Casey came out and looked at the problems, and set up the repairs. Of course, the problems were not covered under the warranty due to the fact that they were caused by ground shifting, but you don't mind paying for repairs when they are done quickly, professionally and with care. I cannot say enough good things about KookCote and their team, which, of course, includes Isabelle in the office who stays on top of everything and keeps things going. GREAT JOB!!! We are very happy with our outside area now that it's the correct, darker color. It looks amazing and we've had lots of compliments on it. We will continue to recommend your company to our friends here at LBJ.